CD Duplication, DVD Duplication, CD Replication UK Services » Blog Archive » CD duplication or replication: Which one is best for you? CD duplication or replication: Which one is best for you? Most people are confused with the differences between CD duplication and CD replication. CD duplication means simply ‘duplicating’ your album, by copying the master copy to several copies. It is a process perfect for producing less than 500 copies of your disc in a short time. The process of CD duplication is ideal if you have to distribute CDs amongst employees at a company meeting or share your music album with close friends and music producers. Most CD duplication companies offer a quick service and use only the latest technology to provide you with the best quality in sound and volume output. CD replication is used to produce much larger numbers of CD copies. In this process, the data from the original disc is replicated into several other CDs and then normally used to produce over 500 copies. CD replication is a commonly used process by recording companies to make copies of an upcoming album. CD duplication and CD replication both produce high quality copies of your album. The main difference between them is the price factor. CD replication is commercially viable, if done only in large numbers. 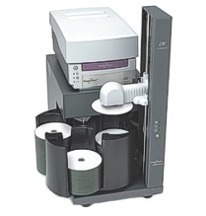 For less than 500 copies, CD duplication is the perfect choice. This entry was posted on Monday, January 26th, 2009 at 4:37 pm	and is filed under CD Duplication Articles, CD Replication Articles.